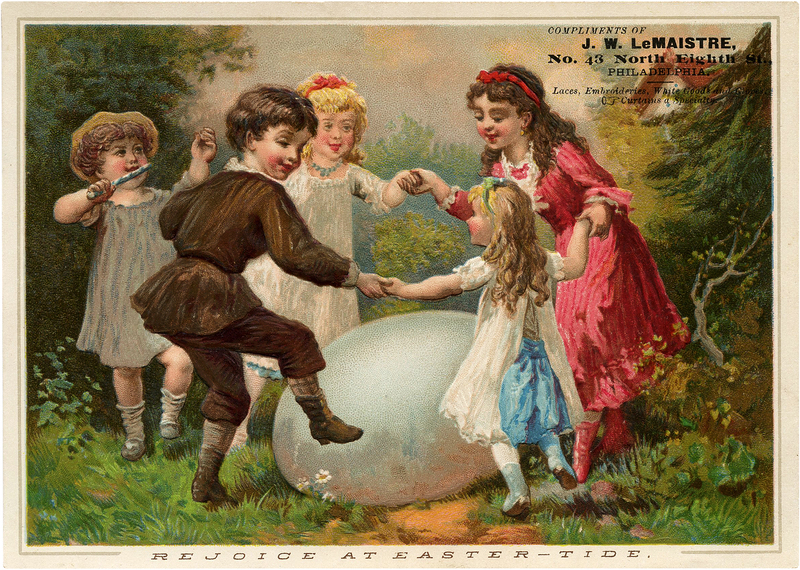 Today we have a captivating collection of 12 Vintage Children with Easter Egg Pictures. All are FREE for you to use! We have cute children in egg images and adorable young children with eggs and flower images. Most are vintage postcards; some with advertising on them. The typography is amazing. 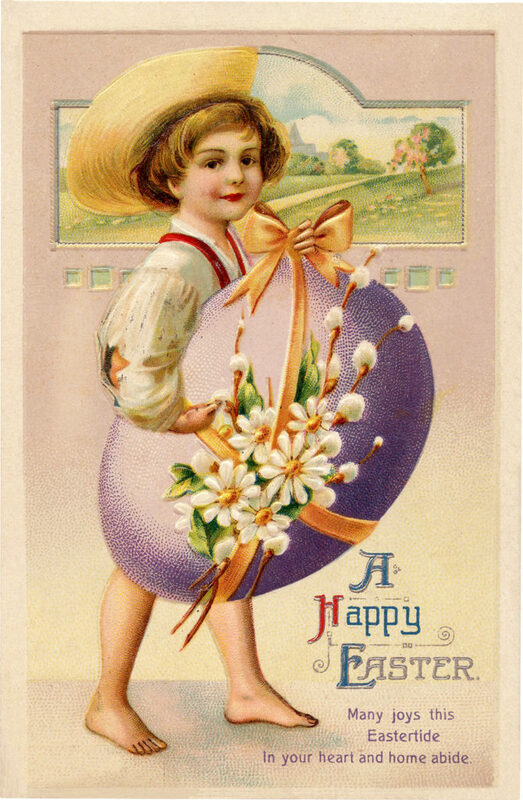 Our assortment of Vintage Children with Easter Egg Pictures are perfect for your Handmade Easter Cards or Craft Projects. How about creating an Easter themed Collage or Junk Journal! This is a precious Victorian Easter card, showing a giant egg with a little child inside. I wish I could find a font that matches the typography on this egg. Fabulous!!! Above we have a Cute Vintage Easter Egg Boy Picture! 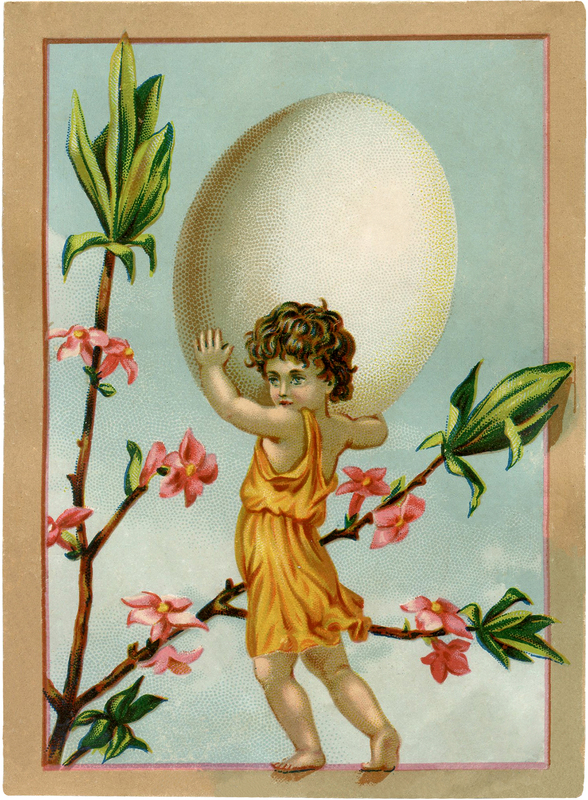 Such a nice Vintage Easter Postcard with a cute little boy carrying a Giant purple Egg. 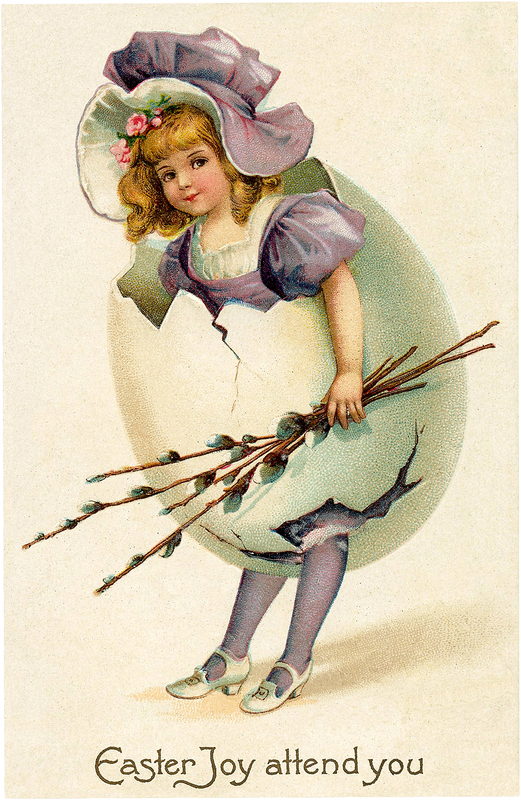 Isn’t this a Cute Victorian Egg Girl Image? 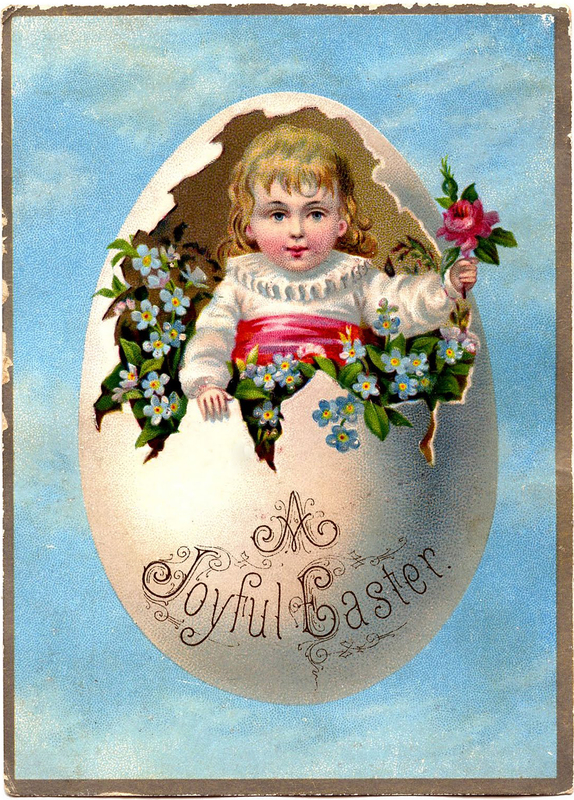 Shown above is a Vintage Easter Postcard with a cute little Girl dressed in purple, hatching out of an Egg. I love this Cute Vintage Easter Egg Baby Picture! 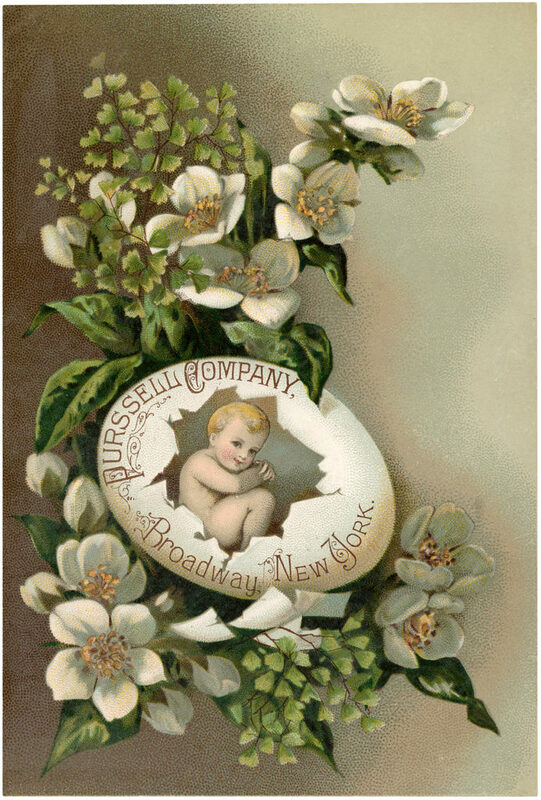 Shown above is a Vintage Easter Postcard with a sweet little Baby curled up inside of an Egg. 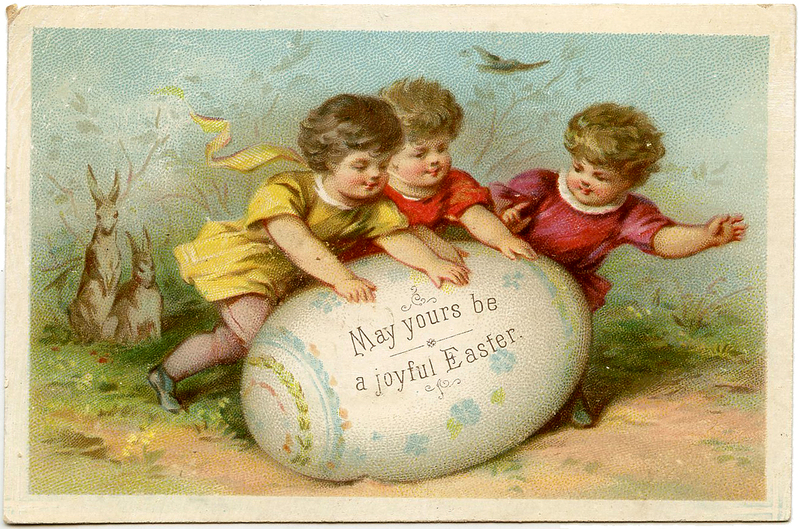 Here is a companion image to the one above of an adorable Vintage Easter Egg Baby Image! 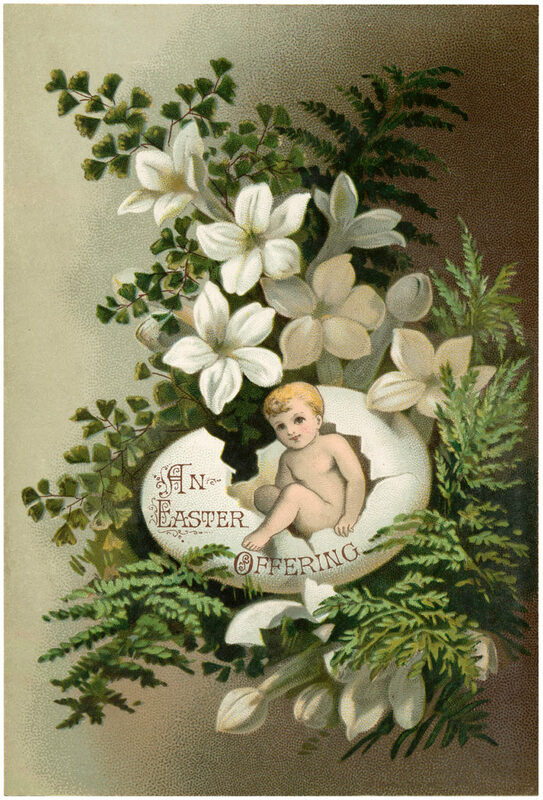 This is a Vintage Easter Postcard with a sweet little Baby climbing out of an Egg. 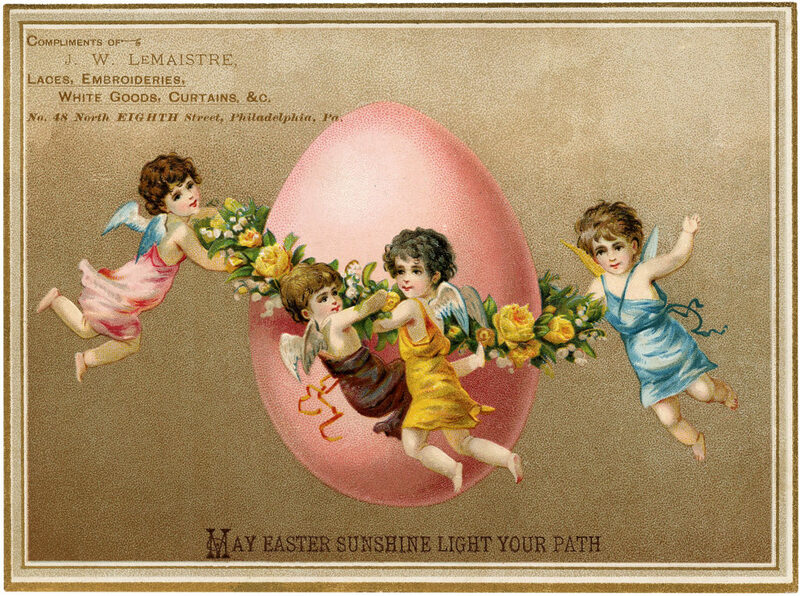 This is a Vintage Easter Egg Fairy Image! 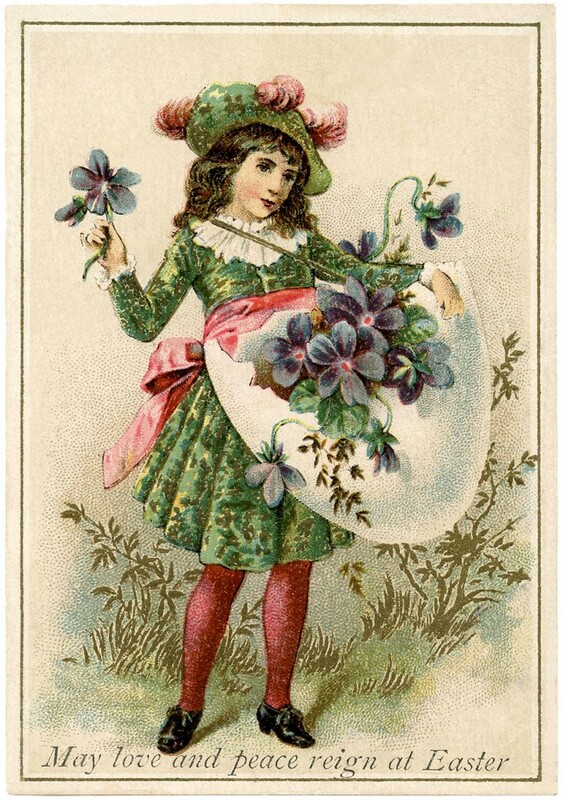 Pictured above is an Antique card with a tiny Fairy carrying around an Egg. This little Fairy could use some Wings I think! It would be fun to add some. Isn’t this sweet?! 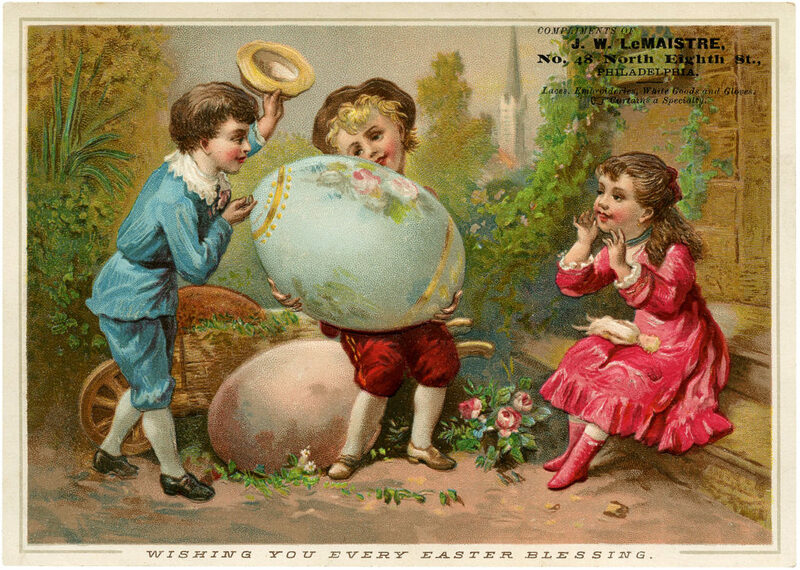 This darling Victorian Easter card shows 3 children with a giant Easter egg! Check out the two adorable Bunnies off to the side! 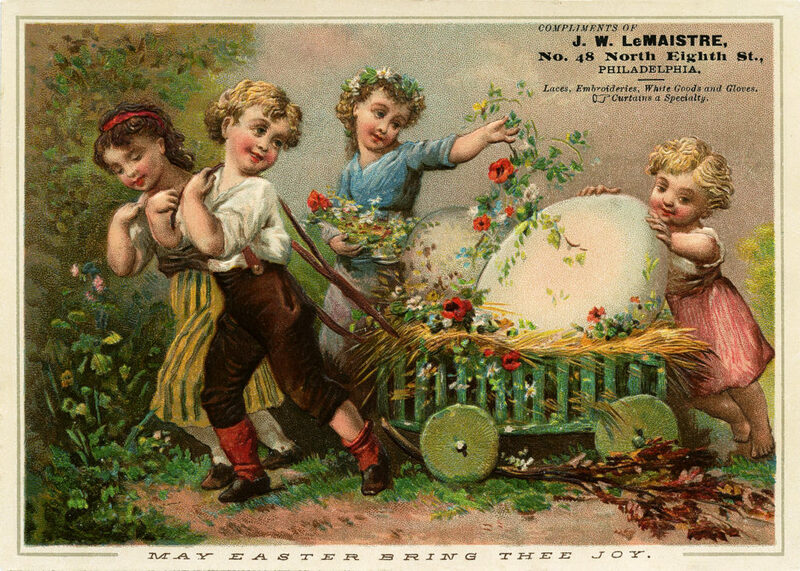 I hope you enjoyed this fun curated collection of 12 Vintage Children with Easter Egg Pictures!!! 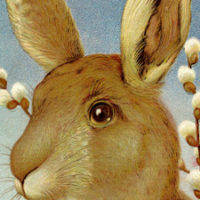 You might also like our 30+ Best Vintage Stock Easter Images HERE. Karen, nice image. That is one big egg! I like the way it’s decorated and the Easter sentiment written on it. Also like the bunnies looking on in the background. I really appreciate your graciousness in posting all these wonderful images! Love this one Karen – thank you! I popped into Fleurish today – it’s looking better than ever! Your stock is to die for at the moment (as it always is!) and I was so tempted to buy EVERYTHING! I had to contain myself and just just brought some trinkets but I will be back….soon! this is indeed a lovely Easter image. I especially like the images with the little Easter peeps. As always, thank you (again) for sharing these truly beautiful images. I’m a french woman and and I love your blog . I have some old images for you if you like . Sorry for my english …. How cute! Thank you so much for all of these beautiful images. These are so special! So colourful and as cute as a button! I really enjoyed this collection you’ve been so kind to share with us! Thank you Irene, you are always so sweet!